Premier acomodações com vistas fantásticas sobre os vulcões Mt Redoubt & Mt Iliamna. A nossa nova cabine knotty pinho está situado na beira de um 200 pés alta falésia com vista para o pitoresco Cook Inlet. Nossa localização isolada na Península de Kenai é apenas uma de 15 a 60 minutos de carro de Ninilchik, Anchor Point, Homer, Kasilof, Soldotna e Kenai. Nós somos uma milha ao largo da Sterling Hwy proporcionando oportunidades para ver alces, águias e até ursos na nossa propriedade de 28 hectares. Além da vista para o mar de tirar o fôlego a partir da sala de estar da cabine, sala de jantar e varanda coberta 20 pés, estamos perto de excelentes oportunidades de pesca esportiva. Cartas de pesca Halibut partem diariamente de Ninilchik e Homer. Excelente pesca do salmão está por perto na Ninilchik, Kasilof e Kenai Rivers. Não esquecer de mencionar mariscos está a apenas 3 milhas ao norte na praia de Clam Gulch. Oceanfront cabine das férias: Quartos Premier com uma vista fantástica sobre os vulcões Mt Redoubt & Mt Iliamna. Nossas novas cabines de pinho knotty está situado à beira de um 200 pés alta falésia com vista para o pitoresco Cook Inlet. Nossa localização isolada na Península de Kenai é apenas uma de 15 a 60 minutos de carro de Ninilchik, Anchor Point, Homer, Kasilof, Soldotna e Kenai. Nós somos uma milha ao largo da Sterling Hwy proporcionando oportunidades para ver alces, águias e até ursos na nossa propriedade de 28 hectares. Benefícios exclusivos Cabin: Além da vista para o mar de tirar o fôlego a partir da sala de estar da cabine, sala de jantar e varanda coberta 20 pés, estamos perto de excelentes oportunidades de pesca esportiva. Cartas de pesca Halibut partem diariamente de Ninilchik e Homer. Excelente pesca do salmão está por perto na Ninilchik, Kasilof e Kenai Rivers. Não esquecer de mencionar mariscos está a apenas 3 milhas ao norte na praia de Clam Gulch. Immaculate, well-appointed cabins 50 miles north of Homer, AK. The property owners attention to detail is evidenced from the exceptional craftsmanship of the cabins and furnishings to the fully functional kitchen. Stunning views abound from the front porch. Exceptionally clean property with cable televisions, washer and dryer, fire pit and grill close to amazing fishing. Excellent location, cabins , view & service !! We stayed here for a couple of nights. What a view of the volcanoes across the water. The inside of the cabin was cozy and welcoming. The kitchen was very well stocked with everything needed to make a tasty meal with that unbeatable view. Hosts are very welcoming and have dine a great job in making these little cabins homey . Will definitely be staying again! I don't even know how to begin. These cabins are amazing! The views are unbelievable and wildlife is everywhere. Everything you could want in a cabin and more. Chuck and his wife have stocked their cabins way beyond what any guest would expect. They have taken great detail in making sure you have everything you need. The cabins are very clean and the grounds are immaculate. Chuck made our campfire every night and all we had to do was light it. One of our favorite thing about the place was watching the bald eagles soar by. I guess because the cabins sit so high on the bluffs, the eagles didn't seem so far away. The location is great for day trips to Homer, Soldotna and Kenai. And Chuck is so great to work with. He really cares about making your stay great. No need to look for any other place. These cabins are the best! Wish we could have stayed longer! We spent 6 days here in Clam Gulch. These cabins are amazing. They have everything you need for short or long term stay. The views are amazing. They are centrally located on the Kenai, great for sightseeing. Hosts Chuck and Julie are warm, wonderful people. We would stay here again and highly recommend the cabins to anyone. My family spent 8 night in these cabins beginning on July 17, 2015, 3 families using 3 cabins. My family 2 adults and 2 teens) stayed in Wild Rose. The cabin was spotless and had just about all the amenities of home--washer and dryer, lots of bath towels and extra sheets. The kitchen was well stocked with pots and pans, spices, coffee, sugar, and creamer, just to name a few things. The bed and fold-out couch were both comfortable. The view out the front of the cabins is amazing. Beautiful view of the volcanoes across Cook Inlet. Fire pits, grills, and picnic tables out front made a perfect dinner spot several nights. Chuck was an awesome host. He made sure we had everything we needed. 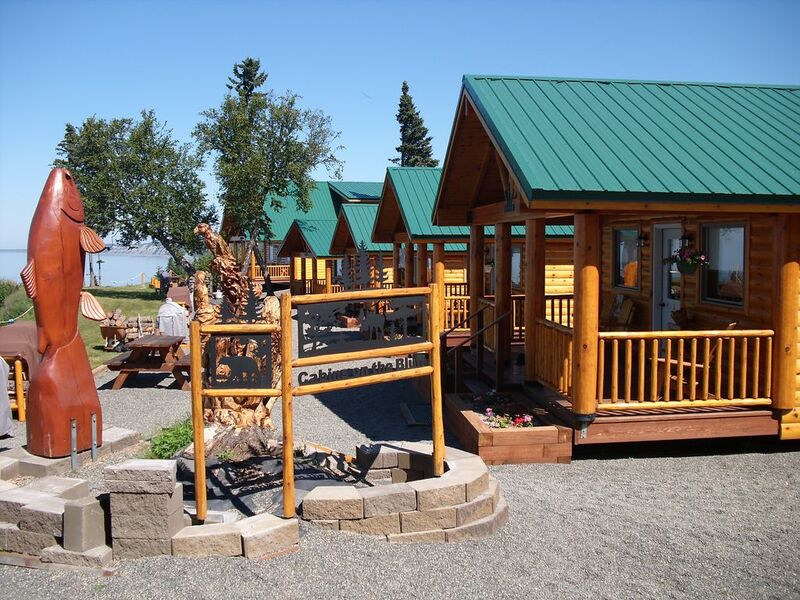 Easy day trips from the cabins--Homer, Soldotna, Seward--make this a great place to stay. Lots of wildlife viewing from these cabins. We saw bald eagles, a black bear, and a moose in the front and back of the cabins. The perfect place to stay! Camarotes no Bluff está localizado na Península de Kenai, a 25 milhas ao sul de Soldotna e 50 milhas ao norte de Homer. Ninilchik e Kasilof são apenas 14 milhas de nossa propriedade.